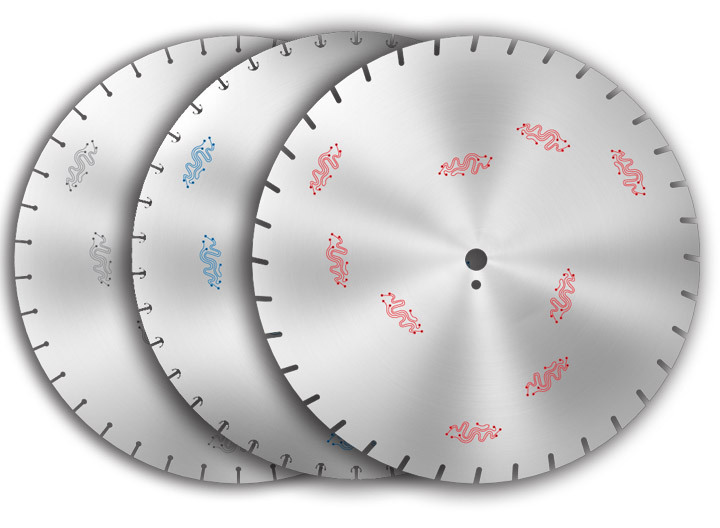 Western Saw Inc's patented RFX diamond core line is designed and manufactured for cutting applications that require noise reduction, increased life, and improved overall performance. RFX line is manufactured from 2" to 84" in diameter and .025" to 1.000" in thickness. With three newly designed cores the RFX diamond core line is the quietest, stiffest, toughest cores available. A two-piece laminated core with our new epoxy filled harmonic dampeners reducing noise levels 16 decibels (dB). Making the RFX-L the quietest, and stiffest core available. Our newly developed RFX-L significantly reduces core cracking, increases life, and can be smithed and tensioned. A stiffer, stronger one piece silent core with our new epoxy filled harmonic dampeners. reduces noise levels 8 decibels (dB). A stiffer, stronger one piece core with our new harmonic dampeners. Reduces noise levels 4 decibels (dB). Reverse engineering services are available. Small or long production runs are accepted with short lead times and on-time delivery.